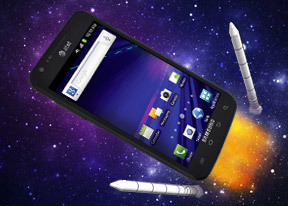 The Samsung Galaxy S II Skyrocket ships with Android 2.3.5 Gingerbread, dressed in TouchWiz 4.0. Ice Cream sandwich has already been confirmed as an update, so the device is as future proof as it gets in terms of software. The lock screen can be removed by swiping in any direction, rather than just sideways. The cool feature where missed events (messages, calls etc) get their own unlock patterns is here too. The homescreen got plenty of tweaks too. You get rectangular design for the widgets and a lot of functionality. The process of adding widgets is visually enhanced too with attractive transition effects. Editing the homescreen panes is business as usual – you pinch zoom-out to display an aggregate view of all panes, which you can then easily rearrange, delete or add. Some of the proprietary Samsung widgets allow you to edit them directly on the homescreen. We find this feature to be particularly neat. The numbered dots that identify the homescreen panels serve as a scroll bar too. A press and hold on the dots lets you scroll sideways through the resized images of the available homescreen panes in one short go rather than with several swipes. The app launcher allows you to create folders inside it (though given that folders are enabled on the homescreen we don’t see much use for that here). Creating folders is pretty easy stuff – in edit mode you drag the icons you want over to a blank folder icon at the bottom of the screen. Then you drag the folder to the screen on which you want it to be placed and pick a name for it. The notification area has been slightly redesigned in TouchWiz 4, compared to previous versions, but there aren’t any changes to functionality there. The task manager, which Samsung has preinstalled, offers a lot of functionality. In this version the RAM screen has been modified, compared to, and there is a single Clear Memory button now, instead of the two in the previous version. Now, with 1GB or RAM and with the new Gingerbread policy of keeping resource-hungry background processes in check, we are not sure you will need to enter the task manager all that often, but it doesn’t hurt having it. It also comes with a handy widget which shows you the number of active applications straight on your homescreen. With a dual-core Snapdragon S3 CPU on board, and a gig of RAM, the Skyrocket offers a pleasurable and lag-free experience. Now, we are about to see how does the Qualcomm creation fare with the benchmarks. With two Scorpion cores, clocked at 1.5GHz, and 1GB of RAM, the Snapdragon S3 will handle any task you throw at it with ease. It does however go a bit easier on the benchmarks than its Exynos packing siblings. We have put together several for you. See them below. Keeping in mind that synthetic benchmarks have little to do with the way you will use your smartphone every day, we can attest that the Galaxy S II Skyrocket did show a miniscule amount of lag, compared to the rest of its Exynos sporting Galaxy S II siblings. It is however, faster than anything else on the market.